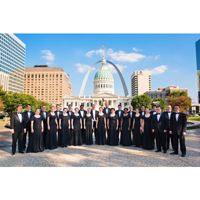 The Webster University Chamber Singers were announced last week as a semifinalist in the college/university chorus division of The American Prize, a national non-profit multi-category competition in the performing arts. Finalists will be announced in several weeks. Webster Chamber Singers were among 13 choirs selected. The roster of 2015 semifinalists includes choirs from a number of distinctive collegiate choral programs, including the University of Southern California, Portland State University and the University of Washington. “It is thrilling to see the Webster Chamber Singers’ dedication and passion for choral performance recognized by The American Prize judges," said Trent Patterson, director of choral studies at Webster University. "It is another indication that our University’s choral program continues to develop a national following." Chamber Singers performed in 2014 as invited guest artists at two different choral conferences, and that same year were featured in an educational DVD produced by Patterson and distributed by industry leader GIA Publications. “Our Chamber Singers keeps going from strength to strength,” notes Jeffrey Carter, chair of the Department of Music. “These students are among our best and brightest ambassadors. We are so pleased to see this national-level recognition, especially in the company of some heavy-hitters in the choral world." In January 2015, Webster Chamber Singers released their first-ever CD, Beginnings, a compilation of concert performances from 2012-14. Their next performance will be on campus at the Community Music School on Friday, Oct. 2, at 7 p.m.